Here we offer you another watch that tells history. The Heuer Autavia 2446C GMT with manual wind movement, reverse panda dial and pepsi bezel. The chronograph captivates with its sporty-elegant appearance and is very popular with vintage collectors. This particular Heuer Autavia GMT is the last MK4 version of this reference and dates back to the 70's. Despite the old age the watch is in excellent and authentic condition. The stainless steel case has natural traces of wear, but is unpolished. The original case profile has been preserved thick over the years. The reference and serial number can still be seen between the lugs. The compressor case has a large diameter of 40mm. The reverse panda dial has also been superbly preserved. The black surface is immaculate. 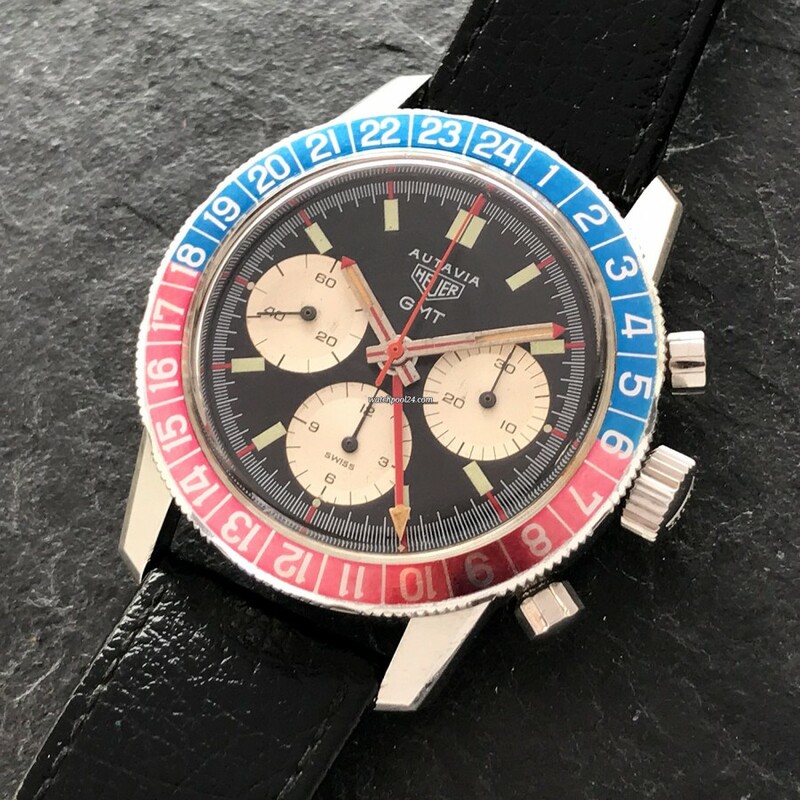 Thanks to the slight patina in the white sub-dials, this Autavia GMT has a real and honest vintage character. All hands have red accents. The hour, minute and GMT hands have luminous inserts, which are fully intact. The rotatable Pepsi bezel has a wonderfully faded color that truly reflects the age of the watch. There are no scratches or imperfections on the bezel. The watch is powered by the mechanical manual wind movement Valjoux 724 with GMT module. Keep this Heuer GMT-Chronograph on your wrist and know that you are guided by mechanical excellence, sporty elegance and unmatched history of the legendary watch maker.